The Clausens’ flooded road leading from their house to the main road. Katie Clausen, 33; her husband, Neil, 38; and young daughter live in Wausa, Nebraska, where they own a small cattle ranch with about 50 cows and 70 feeder cattle. 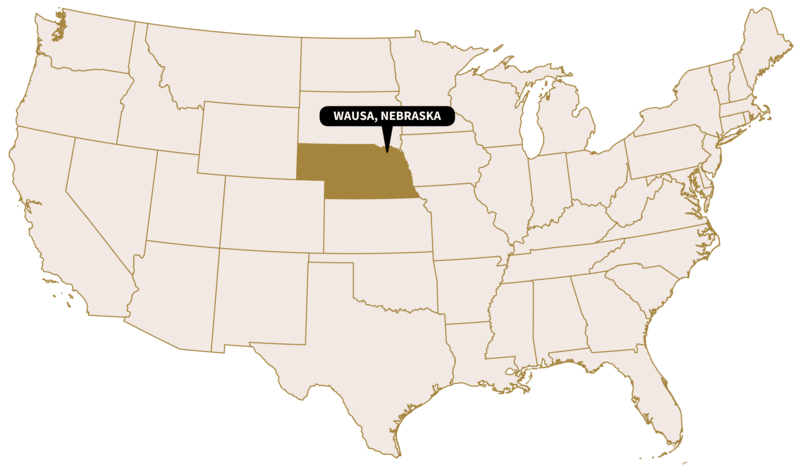 Wausa, a town of about 600 people, is one of many communities across the U.S. Midwest that has been impacted by flooding in recent weeks. Katie shares her experience and explains how the floods have affected her family and her cattle. Can you describe what the flooding was like on your property? How did you respond immediately, and in the days after? The most surprising thing was how quickly the water started rising. 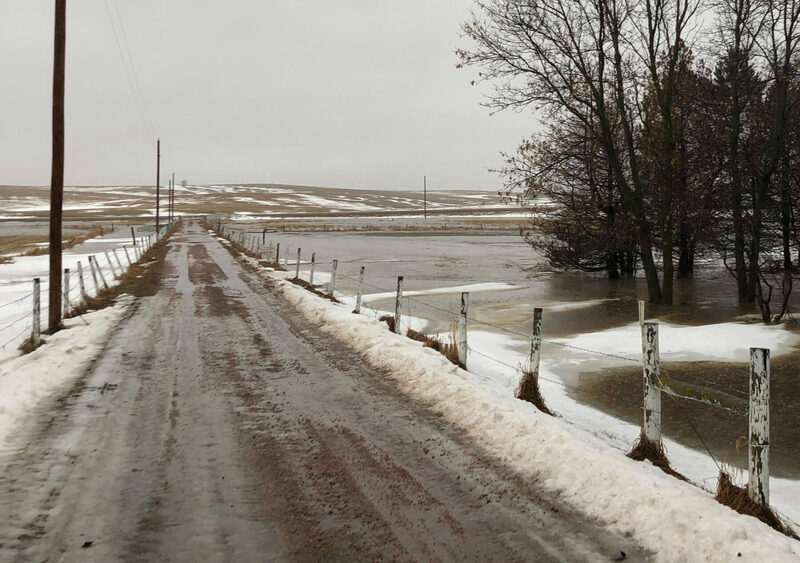 We had some warning that there could be high water that day due to rain and snow melt, but we didn’t know it would be this widespread or happen this quickly. We thought the water would just fill the ditches and creeks for a day or two. Over a span of about 30 to 45 minutes, we could see our place just filling in; roads were being blocked off and water was going over them every way you looked. Our immediate response was to leave our jobs and stock up on supplies, come home while we could still access the house, fill pitchers of water in case we lost power — we have a well — and frequently check our basement. We have a beef operation and we needed to make sure we were here to feed our cows, so fleeing was not an option. The sound was the most unexpected thing — it was a loud rushing, like being near a spillway or a dam or a major body of water, even though you were just standing on a piece of pasture land on the Nebraska prairie. Normally standing on these acres facing west it’s dry, sunny, and expansive. Were farmers in your region prepared to deal with this kind of flooding? Unless you’ve done extensive infrastructure preparations — which would be costly — there is not much you can do for this type of flooding. Farmers can perform a land management practice called “tiling,” where underground piping is put in to help water flow away from the field and toward a source like a creek or ditch, but even that is not designed to assist with the amount of water we had in such a short period of time. The soil was still frozen, which means the water couldn’t permeate the ground. Combine that with heavy snowfall during the weeks prior, and it created a recipe for disaster. Many bridges and dams were badly damaged not just due to high water, but due to ice being pushed into the structures. Many of the roads here are severely damaged. Some of these communities only have a limited number of access points. Fields have huge ruts carved into them from the water, and that will create a challenge for equipment used to work the soil and plant crops. Right now, many ranchers are calving — their cows are giving birth — so that was a concern as well. A small calf will struggle to stay alive in high water and mud. The amount of moisture will also create conditions conducive to disease for these animals in the coming weeks or even months. The road minutes prior to the breach. Were these floods unusual? Have there been events like this in the past, or recently? My husband has lived in this township for 38 years and has never seen this level of flooding, ever. Dams were broken apart; roads were washed away; 6-foot-deep trenches were dug by the water rushing so quickly. This has never happened. How might this flooding affect not just farmers, but other people in the region? More than a quarter of Nebraska’s economy can be attributed to agriculture. One in four jobs depends on agriculture. Almost everyone is affected by agriculture in Nebraska, even if you’re not directly farming. There are the obvious losses to farmers, such as dead livestock, hundreds of thousands of dollars in equipment damage, damage to infrastructure like fences, the inability to plant fields, etc. But this also affects many rural citizens via loss and damage to our roadways and water systems. We live in communities where you can no longer have a baby. An emergency room visit may require a person to drive 40 miles or more. There is no interstate highway here, no Walmart. While our local businesses and physicians do their best to provide us with goods, services, and healthcare, for someone who needs regular dialysis or an obstetric appointment, this could add to their inability to efficiently access that care. Trucks are having a hard time delivering goods to our local grocery stores. People lost their homes, and in some cases will not be able to continue living in our rural communities because of that. There will be less funds from agriculture to support other jobs in our communities as well. Not a lake, but flooded fields along a road. Do farmers have insurance to help with the effects of the flooding? At this time, almost all producers have access to insurance that will assist them if they cannot plant their fields, or if livestock have drowned. However, recouping those costs is not 100 percent. There will still be great financial loss, and it will put some farmers out of business. Some of the insurance programs through the government are not necessarily complete. You can file for assistance through the U.S. Department of Agriculture’s Farm Service Agency or your insurance company, but they make deductions, only cover percentages of losses, and the paperwork and qualification restrictions mean insurance is not something to lean on. Aside from agriculture, many of these rural communities are not in a designated floodplain, and flood insurance for their homes was not available or financially affordable. These residents will have a hard time rebuilding, and the social and socioeconomic impact on our counties and communities will become evident in the months to come. How quickly did you have to act when the flooding started? What did you do first? What struck you as the worst or most frightening part? We did become quite fearful when picking up our daughter from her daycare provider, during which Neil had to cross some pretty high water with her in the car. She is, obviously, our No. 1 priority. It’s also a very weird feeling knowing that, should you need an ambulance or a fire truck, they are unable to reach you. We are very lucky that our lives were not in immediate danger and our home is OK. Many people in our area were not as fortunate. We appreciate how lucky we are. What are conversations like around climate change in your area? The majority of people I know do not “believe” in climate change or are apathetic. I hope events like this urge them to take a deeper look into how our weather patterns are changing. How did the community respond to previous disasters, and how were they able to recover? What makes this different? This is the first time something like this has happened to our communities in a very long time. On occasion we have terrible tornadoes, although it’s rare. During these times, the outpouring of assistance among neighbors and friends is absolutely heartfelt and abundant. We also have a fabulous volunteer fire department and EMT squad — the volunteer firefighters went to another community that was in worse shape than Wausa to help out. People really unite to make sure neighbors are OK. This is a major reason why I choose to live here — people genuinely rally for one another. The sense of village is strong. We need each other. We are there for each other. Maria Rose is a researcher and writer who favors longform writing, data journalism, and podcasts, and focuses on environmental reporting. 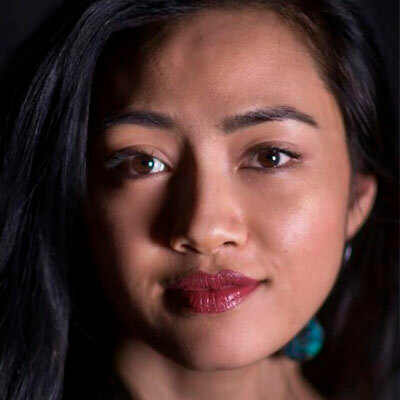 Prior to living in Pittsburgh, Maria worked in Thailand with a local NGO, designing programs on child rights, migrant rights, and statelessness. Maria is also an associate editor for Resettled, a podcast on refugee resettlement with NPR and WCVE, and a fact-checker for PublicSource.